There are days I wish DIY had an undo button. Last week, we had one of those days. At the beginning stages of our kitchen makeover planning, when I showed my amazing I-don’t-even-deserve-him hubs my plans to put in DIY feather finish concrete countertops, he was just as excited as I was. But then we learned… DIY concrete countertops are not the type of project that you can dive into with that kind of heart pumping energy. They take time and patience. Lots and lots of patience. UPDATE: See our full kitchen makeover reveal here! UPDATE: See how they’ve been holding up in this post! Before I tell you about our “oopsie” moment though, I’ll give you the low down on the supplies and steps that you DO need. 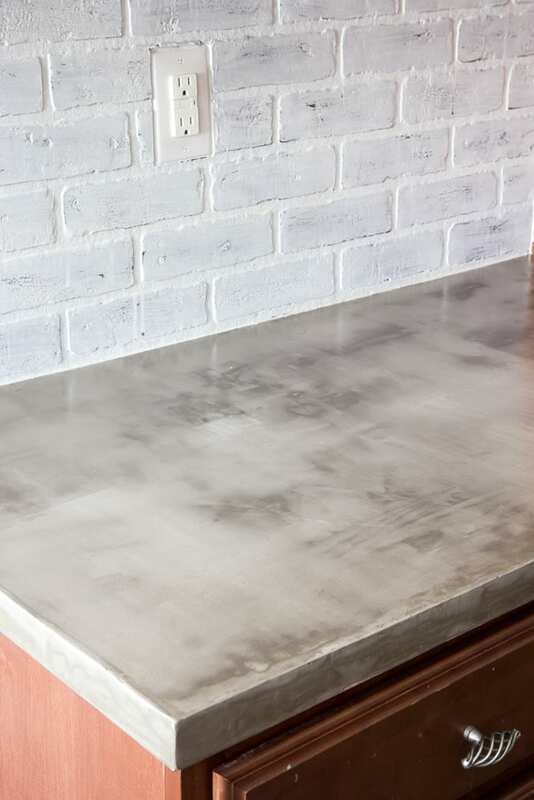 There are a million and one tutorials out there for DIY concrete countertops, some are poured and others are with a skim coat. Since we already had formica countertops in place, we went with the skim coat route. They’re so much cheaper and simpler than the poured kind but are still durable. Our existing formica countertops had a very glossy finish to them, so I roughed them up as best as I could with the my Mouse sander using the 50 grit pads. It felt like I was barely making a dent at all in these things, but it gave them just a little “tooth”. 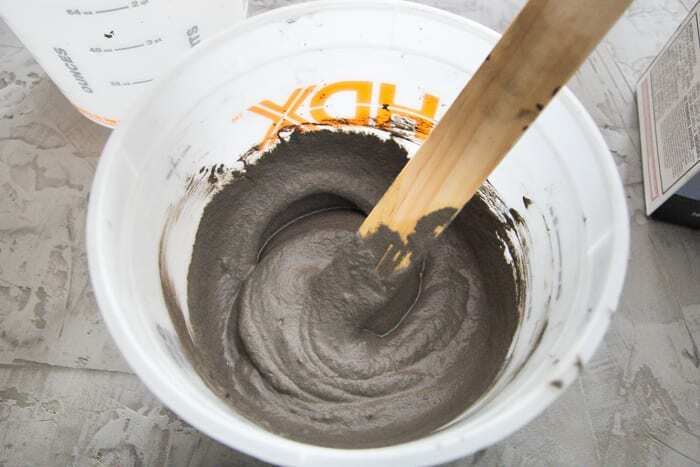 For mixing the concrete, we just followed the directions on the back of the Feather Finish box and measured using two of the buckets with a 1:1 ratio of concrete powder to water. We only mixed a small batch at a time because this stuff dries fast. REALLY fast. I mixed about a quart at a time and that was the perfect amount for me to have about a 10-15 minute window to work with it before it set. But before I get any further, here’s where we messed up. We started this whole huge project on Mother’s Day weekend, which also fell on my birthday. And my super sweet best-hubby-ever said, “I’ve got this. You go have a fun mani/pedi. I’ll take care of the kiddo and put on the first coat of these countertops.” Like straight out of a Ryan Gosling meme, I tell ya. So then I went skipping out the door before he could wise up and change his mind because HALLELUJAH! TREAT YO SELF! But when I got home, and it was time for the sanding step, here’s what we were faced with. It turned out, I didn’t inform Robert that we needed to apply the concrete in a thin even coat and follow it with another coat or two after that. He just slapped the stuff on there, spread it out, and laid it on really THICK. Oops. And he used this trowel at first thinking it was the best tool for the job, but we later figured out that was a little part of the problem. So the whole countertop was crazily uneven and super rough to the point of no return, and I sanded for 2 days to try to fix it. Nope. It was bad. And I felt terrible for not communicating the whole process better to Robert. Big important tip: Wear safety glasses and a mask as that sanding dust is not so fun to get in your eyes and lungs. 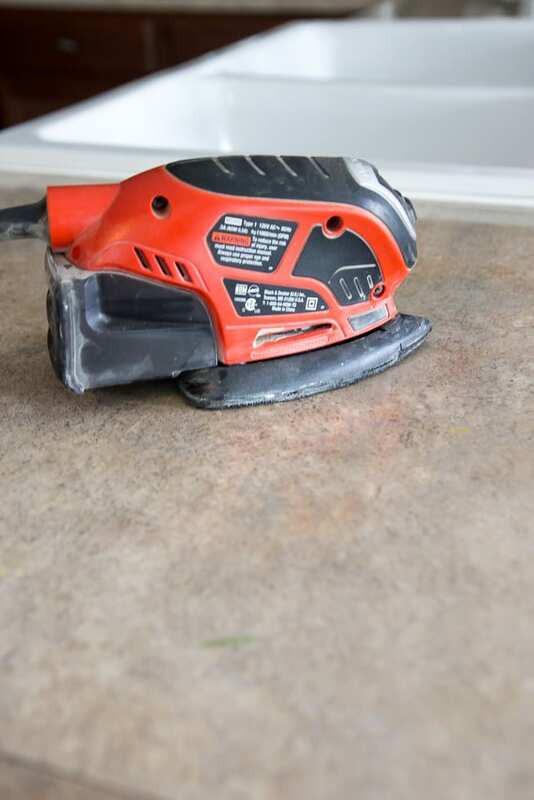 Use a vacuum to remove the dust from the countertop after each sanding session too. After the big sand-a-thon, it ended up looking like this. Ew. No bueno on the splotchy countertops. All of those dark spots were the humps in the concrete that my sander wore down over time. I emptied the majority of the contents of my bucket (about 1 quart of concrete) into the middle of the space where I was working. And this time, instead of a trowel, I used a 12″ taping knife to smooth it all out. It was so much faster and smoother that way. For any of the smaller areas, I used the 6″ knife. And for the sides, I used the putty knife. It was better to wait about an hour or two after the coat on the countertop was dry before applying it to the sides so that I wouldn’t remove any from the top that I’d already smoothed out. I discovered it was best to start sanding about 3 hours after applying a coat of concrete since it wasn’t completely dried but still dry enough to make it easy to work with. I started out after each concrete coat by sanding with the 50 grit and worked my way to the 120 grit and 220 grit as I smoothed everything. I went back over it by hand on a few places too that needed extra TLC. After applying the concrete, waiting for it to dry, and sanding, sanding, sanding for days, our kitchen was nothing but a giant cloud of concrete dust. Behold, the final smooth concrete coat! And this was the aftermath. Everything in our house had a layer of concrete dust on it, so we had to take a day to recollect ourselves and get everything back to a dust-free zone. 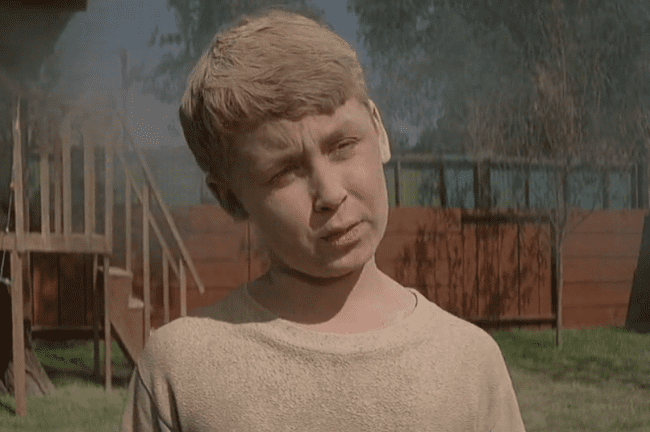 Because seriously, I felt like this kid from The Sandlot when the vacuum exploded in “The Beast’s” backyard. This was certainly the messiest projects we’ve ever done to date. So then to seal this baby! I attempted a sealer at first called Cheng Concrete Sealer, but after three coats and it still not finishing the job and being a big ordeal to apply, I wasn’t really a fan. Plus, it was on the pricey side. Maybe it would work for someone else, but I found a Plan B that worked out better for me. 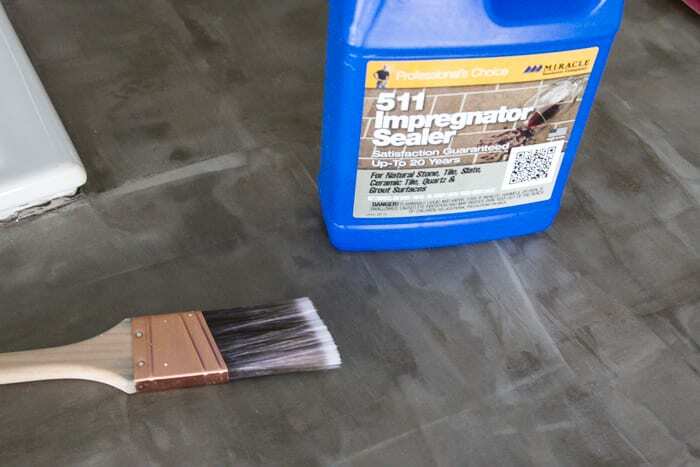 I brushed on 2 coats of the 511 Impregnator Sealer first, which penetrates the concrete and helps ward off stains. I just followed the directions on the back and waited 24 hours between each coat. After the 511 Impregnator had set in for 24 hours, I brushed on 3 coats of the Safecoat Acrylacq 24 hours apart and followed the directions on the back for applying it. I just brushed it on evenly and let it cure to a hard, glossy topcoat. I didn’t think I would like a gloss finish originally but I absolutely love how this final step looks. Our countertops almost feel like granite. Normally, I’m all about the distressed look, but it really took me a day or two to get used to the character in the concrete. Considering the week-long ordeal in getting the snafu straightened out, they came out amazing. All in all, the final cost was about $250 for all 60 square feet of our countertops. We still have a good bit to do in here like going back and sealing around our kitchen sink and painting the bajillion cabinets we have in here (Which are currently in the middle of a priming treatment as I type this. Eek! ), but there’s one other little change I may not have mentioned. We have a whitewashed brick backsplash! I’ll be explaining more about that later, but I’m so glad we went this route instead of with subway tile. 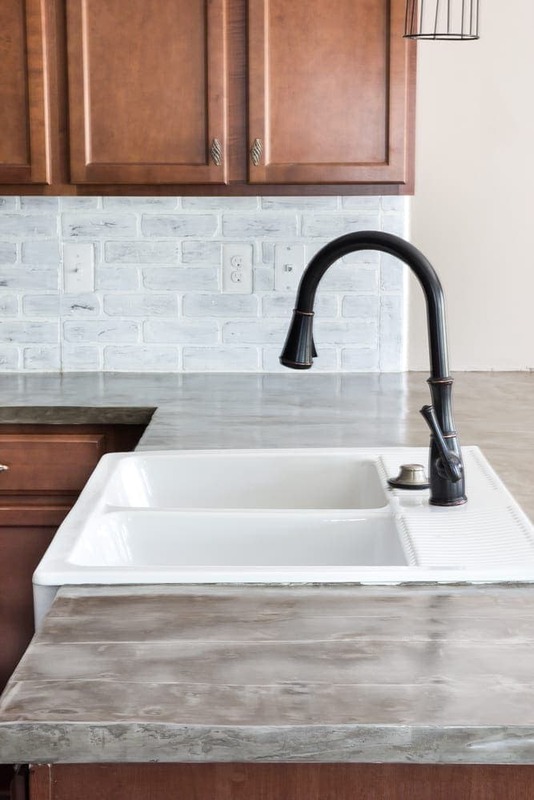 It’s really surprising to me since I’d wanted subway tile since Day 1, but the charm of the brick with the concrete countertops seems to be a great match without being too sterile. I can’t wait to show the next step of this space, but it’s coming along much more quickly now that the messy countertops are out of the way. I’ve never been SO glad to be finished with a project! Whew! 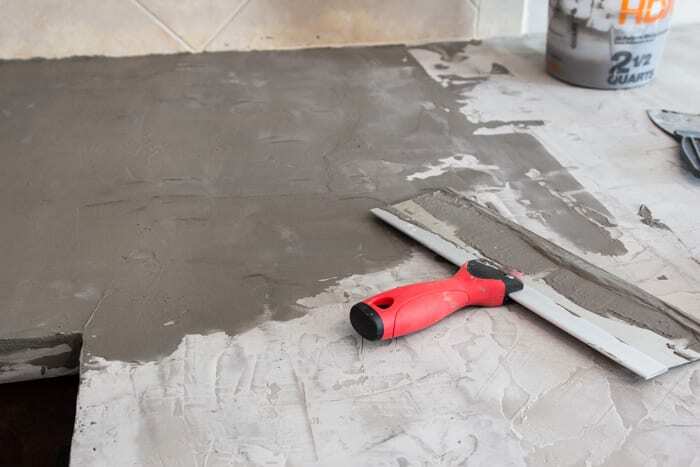 Have you ever put concrete countertops in your house before? Or had your heart set on them? Even though they are messy and exhausting, they’re completely worth it. Oh my goodness, what an ordeal! I probably would have given up! They turned out amazing, as your projects always do! Thanks for sharing the good, bad and ugly of the whole process. It helps to know others experience difficult moments in DIY, but the end is worth it! Thank you, Karen! I honestly wanted to give up, but I mean… I would have been stuck with no countertops so I just had to keep on pressing on. 🙂 I’m so glad we persevered because they were definitely worth it. I keep saying I need to post a Bless’er House blunders because we’ve had so many mess ups before. Haha sorry I shouldn’t laugh but it does sound like something my husband and I would do! 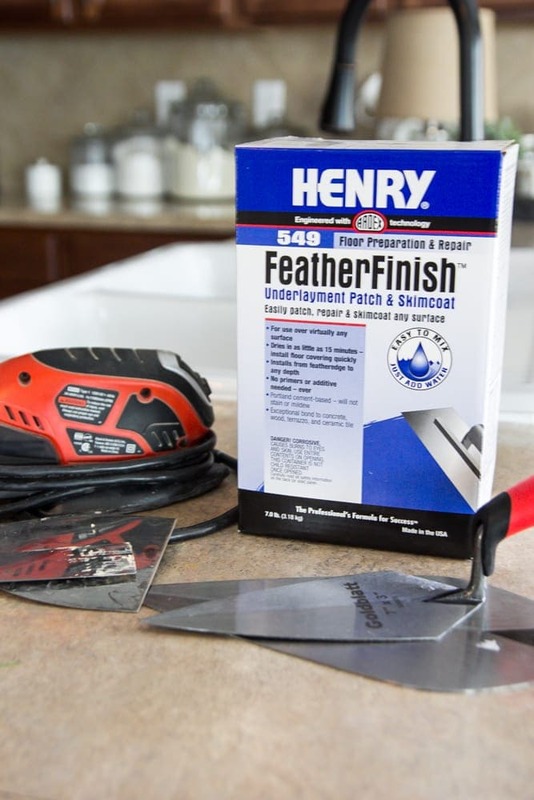 I am confused though when it said feathered finish, I thought you were going to do something to the tops with a feather…duhh, I was thinking perhaps this is an Americanism that I hadn’t heard of…sorry I was having a menopause moment! Great job though doing this without a form and for taking on what is a grand project! Oh. My. Goodness! Thank you for this Lauren! I am so excited to try this and can’t wait to see how you did the backsplash. Perhaps I will do that I instead of subway tile. Love your blog! Oh. My. Goodness! Thank you for this Lauren! I am so excited to try this and can’t wait to see how you did the backsplash. Perhaps I will do that I instead of subway tile. Love your style and tips! ? Wow way to persevere! I’m gritting my teeth reading this. Breathe I keep thinking breath…. When you want to cry but can’t, you just gotta keep working! Great job, absolutely beautiful! Hi Lauren! The hubs and I may be doing this project to our new house. We bought a Lowe’s display kitchen and I’m not liking the counters very much at all. 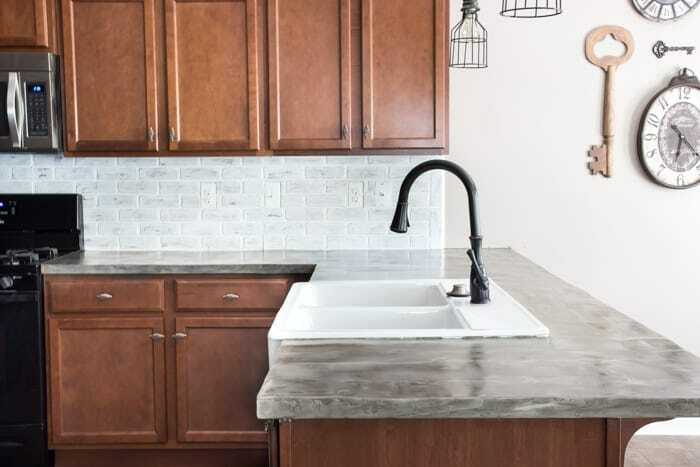 I’d really love to have granite but we need to do something more affordable and I’m really liking the concrete counter tops! Thanks for the do’s and the do not do’s! Love your style and blog!! If you can handle the chaos for about a week, you will love them. 🙂 Now that the sealer is on, it almost feels like granite. I’ll have to share how they hold up over time in a few months maybe. Thanks so much for the love, Sherry! I contemplated concrete when we remodeled our kitchen, but ultimately ended up with a grey caesarstone in a honed finish. However, I did mess up screeding the entrance hall (while prepping to put down marble!) and decided to sand it flat because it was all uneven. It was a nightmare, there was dust EVERYWHERE for ages. It was then one project that husband dearest sternly warned me never to even think of doing again. There’s always that one DIY where you’re thinking, “My husband is going to kill me.” Haha! Definitely been there. So sorry you had such a bad experience! Haha! Glad to be the guinea pig. 😉 As for the concrete, if you wanted to get it as smooth as possible, the poured kind might be best. But they’re more labor intensive and more expensive. I think if you stuck with very thin coats (unlike what we did at first) you could still get it very smooth. We’re very happy with ours now. Hi, Pat! You know since I haven’t personally worked with the plywood, I can’t really recommend it, but I think I would be worried about the plywood warping and swelling because of the moisture in the concrete. You could probably do plywood with tile backerboard on top though to act as a barrier. Interesting post but 14 pop-up ads were a little much! You’re getting 14 pop-up ads?! There should be nowhere near that many! So sorry, Ellen. I’ll look into the ad issue because that would annoy me too. Something isn’t right if that’s happening. SO PRETTY CAN NOT WAIT TO HEAR THE DETAILS ON THE BACK SPLASH!!!! Thanks, Kimberly! Can’t wait to share it! It’ll be on Remodelaholic in a month or two. I think the concrete looks great. I love the character of it, granted it is not for everyone. And I really love the whitewashed bricks Lauren. I’ve been trying to add texture to my house as well and was even considering faux painting some of these on the wall. Of course, yours are even better and they make a nice contrast to the countertops. I am really looking forward to your kitchen updates. The counters look amazing! Sorry about the initial problem, but looks great now! I was wondering what paint you are using on your cabinets. I’m just about ready to start mine and I’m using Fusion Mineral Paint. I have to sand mine due to a really crummy prior paint job and am dreading it, but I know it will be worth it. I can’t wait to see yours finished! FYI I only had one popup on each of the first 9 photos this evening, but had multiple ones on nearly every image earlier today! weird! Haha! I can imagine. If he’s not excited about it now, he definitely would not be happy in the middle of the whole process. I don’t know if I’ve ever seen it done on a floor before! That’d be interesting to see. The countertop looks great. Thanks for warning all of us what not to do. I really, really, really like the new backsplash, which surprises me. Can’t wait to see more pictures! Congrats on your progress. Thanks, Stacy! Can’t wait to share more about that backsplash! It only cost us about $75. It is hard to grasp at the ordeal you had to go through because the end product is sooo fabulous!!! Way to stick with a project and seeing it through!!! Looks great! We went back and forth trying to decide if we could attempt concrete counters ourselves… I chickened out! It’s certainly not for the faint of heart. 😉 Love the end result though. Sara do you have pictures of the colored Concrete you would be willing to share? Thanks for your humorous honesty in sharing “the good, the bad, and the ugly!” It really helps knowing the reality of DIY. Your perseverance paid off, your counters look great! Looking forward to the rest of the project. Your home is beautiful. Thank you for sharing it and your design ideas with all of us. My pleasure, Karen! It’s good to know what you’re REALLY getting yourself into. 😉 Definitely worth it though. Thank you so much! How did you do the edges? We’re thinking about trying this on wood, since we have no countertops right now. We’re almost done! We had already torn off our tiled countertop, so talented hubby made counters out of wood, which we coated with the concrete, we did 3 coats and the great thing is, we did it in the garage, so most all of the dust from sanding stayed out there! Somehow some of the dust still made it’s way in through the attached garage 🙁 Then we just carried them in and set them on top of the cupboards, they were a bit heavy! Getting ready to seal! I’m so excited they are coming out great. Thank you for giving me the courage to do this! YAAAAY! I’m so glad to hear that, Laura! I’m kind of jealous you guys got to do yours in your garage. 😉 Hope the rest turns out well! I have applied the 2 coats of 511, I can see brush marks, is that normal? Will the Safecoat cover those? Thank you for your help! Hi Laura! The 511 will make the concrete look wet at first, but then it should dry in a few hours. I don’t think I saw brush marks after it dried though. The 511 penetrates the concrete to help ward off stains and the Safecoat is more of a shiny top coat to waterproof it. Maybe try testing a small spot with the Safecoat to see how it does over a brush stroke, and if it shows, you could try to do a light sanding to see if that helps. Do you have to apply 511 first if the safecoat waterproofs it anyway? Getting ready to cover my old lamitate countertops this week! 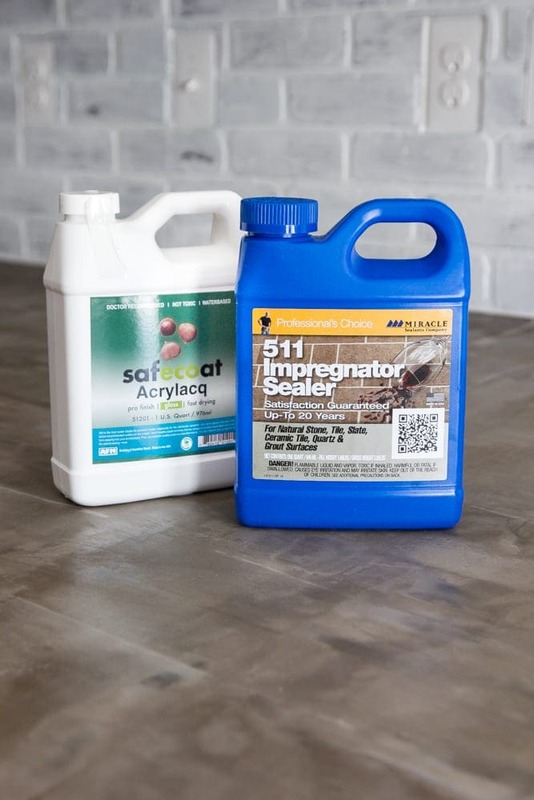 The 511 is what penetrates into the concrete and seals within, and the safecoat is what seals on top. Both of them working together just serves double duty for extra protection, but you could certainly just do the topcoat if you’d prefer. I don’t know how durable it would be with just one. Good tips! Thank you for sharing them, Kristine! What a great guide! Your countertops turned out wonderfully – and you are TOTALLY right in how much time, energy and perseverance a project like this takes! I tackled this project with Ardex Feather Finish in February on my kitchen countertops and was horrified by the amount of dust it created but absolutely love the finished product. I used the same sealer as you did, but did not use the 511-Impregnator Seal first. How are your countertops holding up to oil / water / acidic stains? I’m finding the area around my stove is just littered with dark spots that never go away! I have photos up on my blog — I’d LOVE any feedback and advice you have! YES! Total mess but so far, we are very happy with ours. We haven’t had any issues so far and we cook 4-5 times per week, so it seems the 511-Impregnator did the trick. Time will tell. I’ll try to post an update around the 6 month mark. So far so good! We’ve had the counters done for a month and a half now and they’ve held up great, even after a couple of summer cookouts. I’ll probably write an update about them around the 6 month mark to show how durable they are. 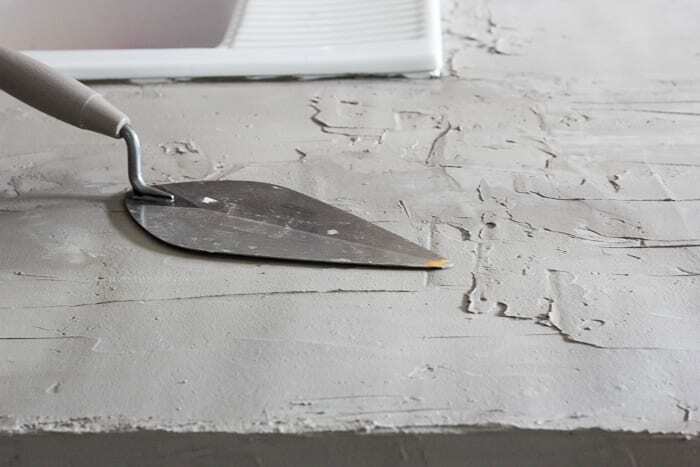 This is some really good information about how to make a really amazing concrete countertop. It does seem like a good idea to have a professional help when doing something like this. I am not sure that I would be able to level the countertops correctly. Wondering how you got the different colors in this countertop? Did it just dry that way? Looks lovely! 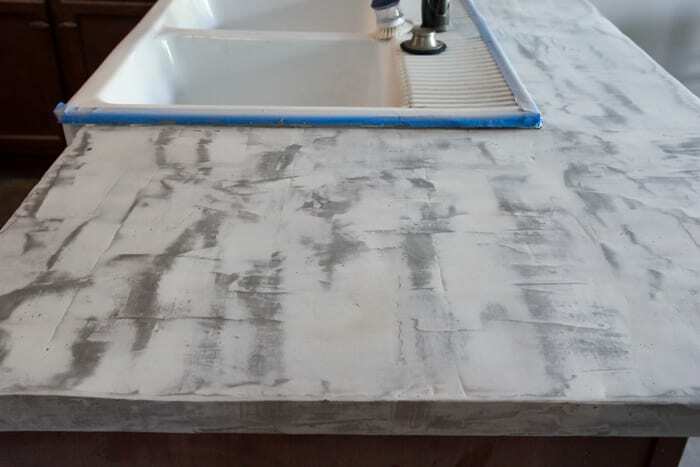 I’m considering a concrete worktop project myself and through research I’ve heard that it can easily stain, especially with oil/red wine…the usual culprits! I was wondering how it’s looking after a few months of use. Great job perservering by the way! I actually plan on posting an update soon with how it’s holding up, but so far, we have had some staining issues, mainly with grease spots around the stove. We put a kitchen towel down on the counter now whenever we’re cooking something with popping grease. It has some scratches too, but all in all I’d still do it all over again and we still love it. Hi, Corey! We didn’t remove the sink actually. We replaced our stainless steel one with the apron front sink first. Then we just worked around it doing the concrete countertops. But you could definitely remove it if you wanted to take that extra step. We still love these countertops. We’ve had an issue with some brown splotches around our stove where we cook and grease pops on the counters, but we’ve learned we have to put a couple of kitchen towels down to protect them. I hate we’ve run into that, but considering how cheap they were to do, it’s still worth it in my opinion. The only thing I would have changed is applying a smooth layer the first time. That would have saved us a lot of headache to fix our mistake later with all that sanding. As for the cabinets, they are holding up perfectly! I haven’t used milk paint for cabinets though. We used Benjamin Moore Advance paint. I know that’s what many professionals use and it’s the most highly recommended. Hope yours turn out well! Would you recommend the 511 Porus plus? I don’t have any personal experience using it, so I can’t really give it my stamp of approval, but I’ve heard good things about it. Ok, thanks! 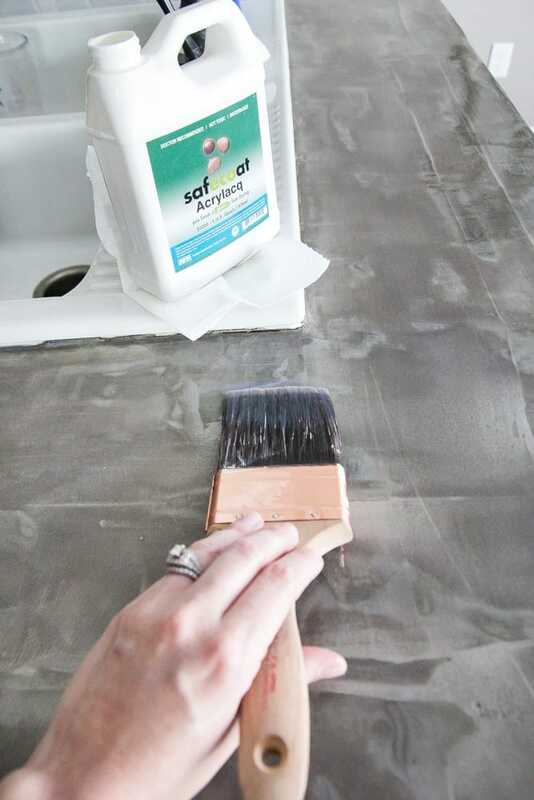 Did your counter darken after the top coats? With the sealer, what kind of finish does that leave in the end? Do warm or hot items stick to the counter? We’ve had this experience in the past and I’m just trying to make sure before ordering what you’ve suggested ? The finish is very glossy and has a wet look to it. We haven’t had any issues with warm items sticking to it. We try not to put hot items directly on it though because that can discolor them. We just treat them like we did when they were formica. Because of your complete and very detailed directions our counter tops have turned out magnificently. We live in a timber house and we were looking for something slightly industrial, this is it. We used Ardex instead of what you used for the feather finish, but everything else we followed your lead. Good suggestion about the towels around the stove….I’m hoping I can embrace the wear I will start seeing, after all it is an industrial look. Thank you for the very detailed directions! Yay!!! So glad it helped, Lisa! Love how your countertops came out! I would love to replicate this in our home but we have tile down already, do you think I could go over that texture the way you have yours? Thanks, Kelly! 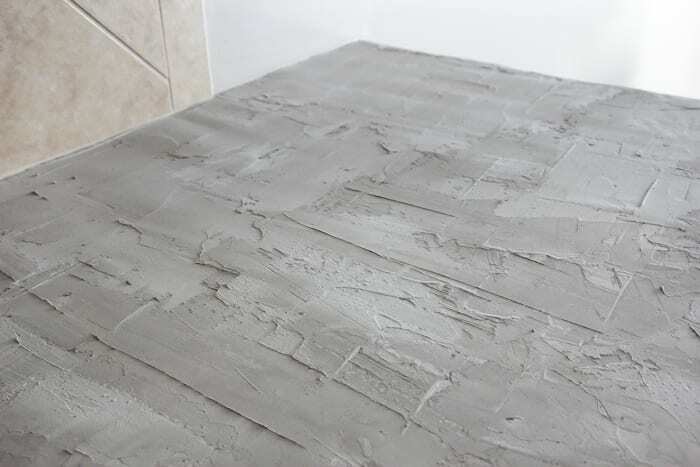 Hmm… I’ve never seen it done with tile, but I don’t know if I would chance it since you run the risk of tiles cracking and you don’t have a completely smooth surface with the grout lines. How is it holding up now? Any chips or cracks? Oh my gosh Lauren!! Too funny! Sorry for all your headaches but in the end I’m sure you’ll say it’s worth it! I just left a comment on your IKEA sink, since we bought the same one AND the same faucet…was just thinking oh the similarities of good taste are crazy but thennto see THIS!! 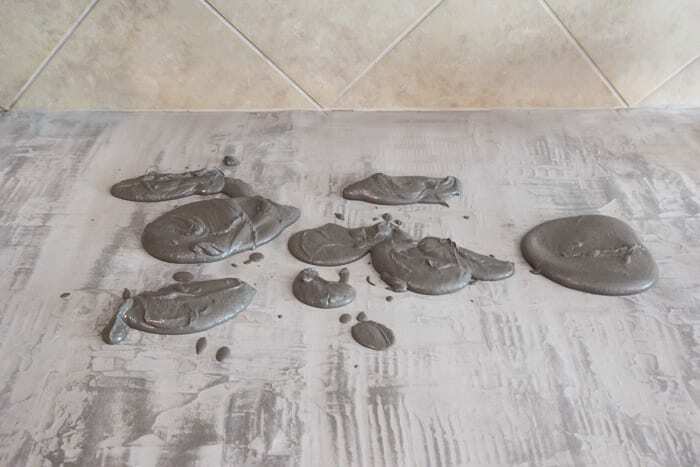 I’m currently in the waiting stage of our cement over laminate countertops. Though we didn’t have the same oops as you all had I wish I’d seen your blog before beginning this (by the time it’s sealed) 10 day journey to concrete heaven! Ack! I FEEL your pain, Alex! Haha! It’s totally worth it in the end. Oh my. I’m in the midst of my concrete countertop fiasco now. It’s been since February since this “ordeal” began (whole kitchen reno) and has been so stressful that I’m now just wanting to seal the counters and get on with my life! I’m very appreciative of your blog post and would love to see the finished kitchen! I’m headed out today to get the sealant. Unfortunately, my locale has proven to be a hindrance in locating and purchasing the epoxy over the counter. But at least I know what to look for now! Thank you for sharing your experience! …sounds like you are blessed with a supportive husband as well! Continued blessings for you and your family! We are starting on our concrete countertops today! Thanks for all the good tips. I have done several counter tops, a back splash, and two bathroom floors using Ardex and Henry’s. They have all turned out great. I’ve wanted so many times to shout this out: Use a knockdown knife to spread. -way better than a taping knife. And you will barely need to sand – no kidding! I have never seen anyone recommend a knockdown knife on the many DIY Ardex counter top blogs but I tell you, it is the way to go! You can find them in the textured wall section in the big box store. Ooh good to know, Lisa! Thanks for the tip. I’ll definitely try that if we do it again. What color concrete did you use? I am in the process of completing this project. I have a few questions. How many coats of the feather finish did you end up having to apply? Is there another sealer you can recommend besides the Safecoat Acrylacq? Usually, you only need to apply 2-3 coats, but because of our little mess up, we ended up having to do about 5 coats to correct our mistake. If you want a different sealer than what we used, I’ve heard good things about the Cheng brand concrete sealer. http://amzn.to/2m6unFi I didn’t personally like it as much as the Safecoat Acrylacq, but maybe that was just my experience. How did you do the backsplash? Hello! 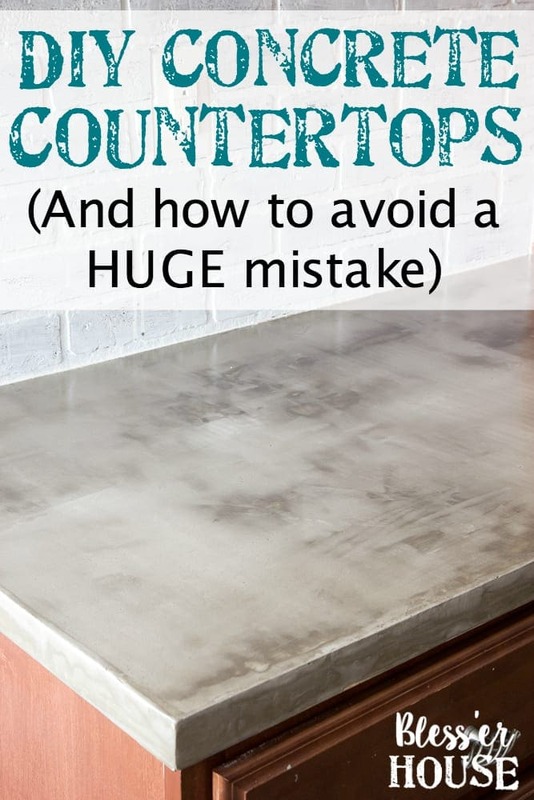 My husband & I are thinking of giving this a go but I’ve heard that concrete countertops don’t hold up well, can I ask how yours are doing now? I never left a comment before but after looking at your kitchen remodel I just had to. It really looks amazing! You remind me of my wife and I. Especially with the problem with the counter tops but it turned out great. I definitely want to try out the Stickwood in our kitchen and feel better about painting our cabinets white like you did. I’m also glad to see how the Henry’s featherfinish worked. I’ve seen many other projects where more expensive resurface were used but looks like it held up well. Thanks. And God Bless. Do you regret leaving the sink in? 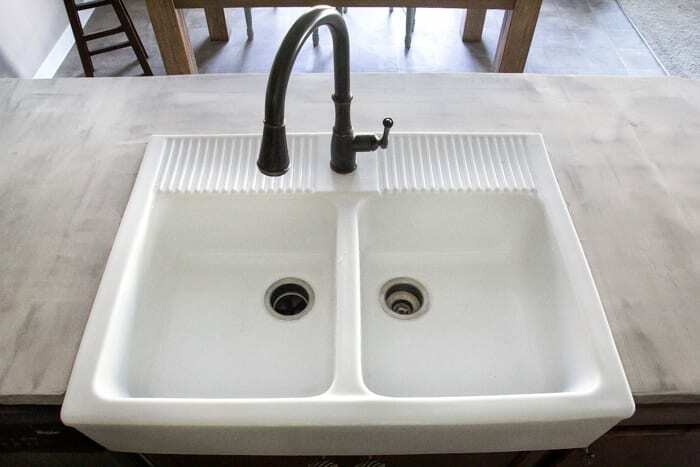 I’m in the middle of doing this to my counters and I can’t decide if I should removed the sink first and cover the counter under the lip, or just do what you did and pour around it. We have a drop in sink though. Thoughts? Thanks for posting not only your sucess but issues as well. 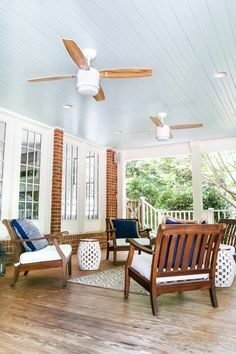 I want to do this but I think the hubs might kill me… I thought about taking out the counters and doing them outside in the garage,I have 3 cats, 2 dogs, and 3 kids so the dust wouldn’t be good for them at all. Do you think taking them out would work? I also will be adding in two small sections of counter because my kitchen has NO surface space and if I do this I can buy whatever pieces the home improvement store has on clearance and the will match when I’m done!!!!! Hi! We did our concrete counters the same way and utilized the same sealers. A few weeks later our dog decided to put her paws up on the counter and tried to reach for food leaving scratches all over it. What’s the best way to fix this?? Hi just curious did you leave the sink in or lift it out before applying the concrete? Hi Ryan. We had to leave it in, but you could certainly lift it out if you preferred. I am planing to have a concrete countertop for my kitchen made but with the sink also from the same material. Do you think it is a good idea? Because of the sealing? Hi Dominika! Absolutely! I’ve heard of great success with concrete sinks. Are you planning on having it poured? Not skim coated? That would make a huge difference, I think. Poured concrete would definitely be the most durable. Hi! 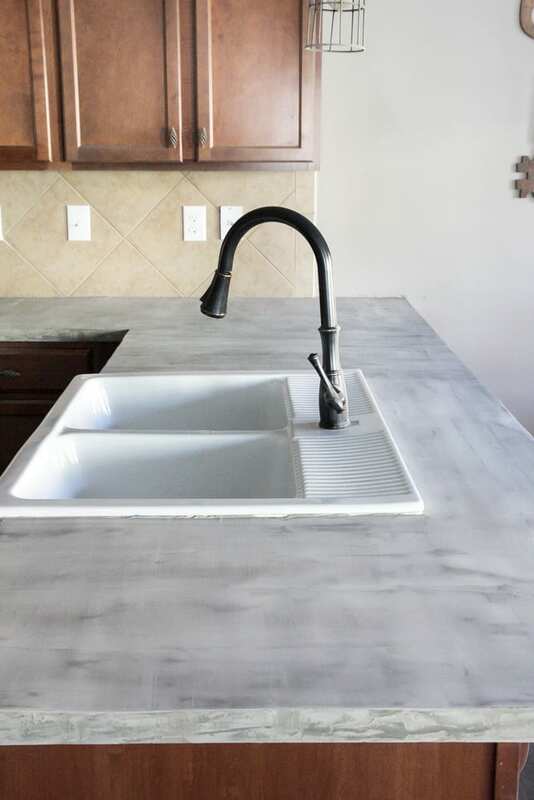 Quick question for you – are your countertops 1-1/2″ thick? I was so ready to try this when I realized my countertops are only 1-1/4″ thick – was just curious if it would still work. Thanks for sharing – you have given me inspiration! We got a $65 bid to redo our kitchen, I was devastated – no way we could do that. So I am embarking on this process of revamping myself. Will let you know how it goes! Hi Lauren! I can’t tell you how many times I’ve read this blog, and I so appreciate it, and all the comments to it too! I am getting ready to do my kitchen counters. I’ve BEEN getting ready for many months, but I keep chickening out! My biggest concern is the color. I stained my cabinets dark, about the color of coffee beans, so I want my counter to be an off-white color, not gray. I haven’t been able to find any other blogs where the DIYers made the counters lighter instead of darker. Is it possible to get a creamy white color with the feather finish? If so, what do you use to get that color? Thanks so much!! Hi. 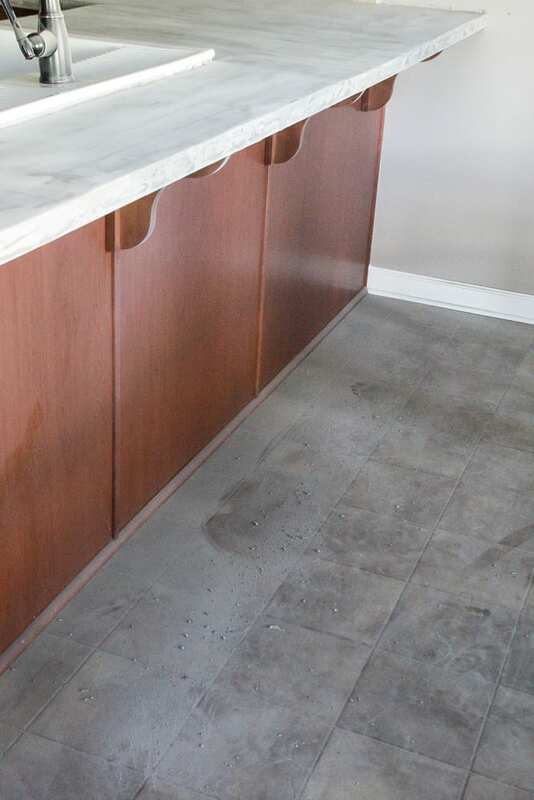 With the concrete countertops could you apply concret paint to them and thn seal them? I really like the idea, but I don’t like the plain color. Thanks! Hmmm… I can’t say in good conscience that it would definitely work, but I think there’s a good chance it would! I’d maybe test it out on a piece of plywood first just to see how it holds up. I’m curious, and you may have already replied about this to someone else, but from start to finish (mistake included) how long was the process? It’s been a couple of years now, but I recall it being about 4 days total. Love your blog! Referred to it MANY times as I was putting an overlay on our bathroom counters. I had one question though. I removed as much dust as possible with a brush and shop vac. Should I wipe it down with a damp cloth to get the remainder or just go ahead with the impregnater? Everything looks good so far and I dont want to mess it up now! Ant input would be appreciated! Thanks, Angela! Yes, I would give it a quick wipe with a tack cloth to eliminate any residual grit. 🙂 Good luck with it! I just want to say thank you for posting this. We are getting our house ready to sell and have been updating our kitchen on a DIY budget. Looked into paying someone to do this and found your post on Pinterest after researching how they were going to do it in the first place. Thereby, discovering I could do it saving us over a $1000. So I did it!! The only difficulty I had was with my mouse sander as it left squiggly marks when pushing too hard. But it honestly adds to the character of the finish and it’s not real noticeable unless you look closely. So in love with them and I still can’t believe I accomplished this. I would like to know how they do over time and if there are yellow stains when hot things are left on the surface. I have heard this is a problem with concrete counter tops. You are not the first person to ask 🙂 I wrote a blog post here on the good, the bad, and the ugly. Did you have issues with bubbles in the acrylacq? If so howndidnyou rectify? Thanks!! Not really, but we made sure not to shake the acrylacq to mix and stirred instead to reduce bubbles, the same as how you would treat a polyurethane. You could you a foam brush to help smooth it too. Just don’t overbrush it or it can cause brush strokes and bubbles. Just want to say thanks for taking the time to share and also for describing what you would have done differently. I am considering covering my fireplace using Henry’s and will *not* be striving for a completely smooth finish as is desired in countertops. I was looking for an example of the look you get when you use a spatula. I now have some ideas of how I might texture my fireplace. I did a test run on an Ikea side table and am pretty happy with the results so far except that on my first layer I was using a cheap sander that left a couple of big scratches in the finish. Did you have any issues with scratch marks using your sander? I’ve since upgraded to a quality orbital sander and am very happy with it but I can still see the scratch marks from the first layer. Should I do a couple more layers to cover that up? Secondly – how long after the last layer did you wait to put the sealer on? And how long after sealing were you able to use the benchtops again? I’m also a bit nervous about the dust mess it’s going to create but will just throw drop sheets on everything in that section of the house. Hi Linda! (Thank you!) Yes, we ran into that problem too because of the veeeery rough first coat. Keep applying light layers as smooth as possible, sanding in between with the orbital. It’s a total pain, but it’ll be worth it. I would wait at least 24 hours before sealing and then another 24 hours before using them. For the dust issue, be sure to turn off your HVAC system so you don’t circulate it throughout your house. Hi! Love your countertops! 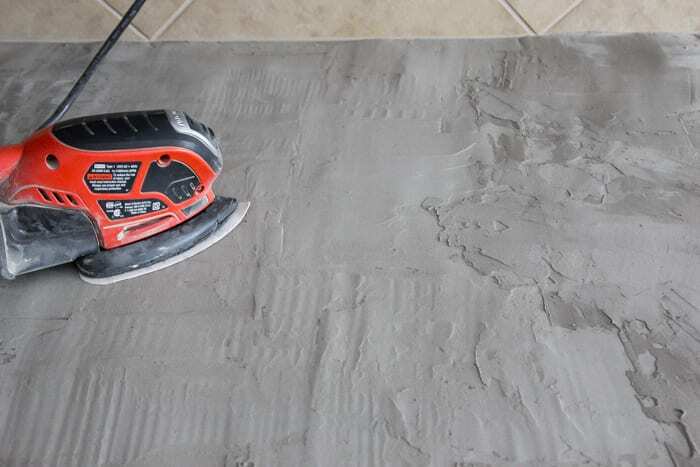 I’m ck sidering putting concrete countertops I my house that we are building and I’m wondering now that you’ve had your countertops for a while? Do you still Live them? Do you have problems with keeping water stains off them? Keeping it sealed? That ks for any help or advice you can give!! This is a great tutorial. What would you recommend as a top coat for a more matte finish? Hi Lauren, I watched your step by step on concrete counter tops. I too need new counter tops on a budget. It has been a couple of years since you did it. Have you had any problems with cracking or anything else? Hi Debbie! We have since moved out of this house, but we did visit the new homeowners last month at the house and the countertops still look AMAZING! The one thing you need to be concerned about really is making sure to reseal them every year and don’t let oil or grease sit on the countertops for too long as that can sometimes discolor them. But ours held up beautifully. Lauren- beautiful! I have been researching the concrete overlay, as well as sealants. I know this project was 2 years ago, but I’m wondering if you remember how much of the sealants you used for your kitchen? Hi Karie! As I recall, we ordered 2 of each sealant step for our kitchen, but I don’t remember our square footage to give you an idea of size. It turned out beautiful! Where did you find your backsplash?! Hi, Brittany. Thank you!! The back splash is from Home Depot. With a quick google search I see they are still carrying it too. WOOHOO!! Beautiful! I’ve been wanting to do this for a long time. My husband is reluctant because he thinks they’ll be excessively heavy. Do you feel yours are heavy or do the light coats keep the weight down? Nope! Since they’re only skim coated, they don’t have too much weight. It would be a different story if they were poured concrete though. 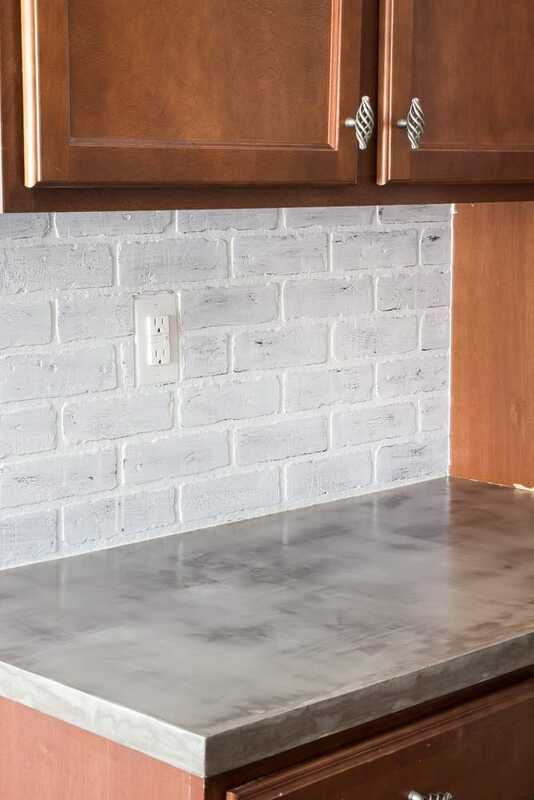 How has your faux concrete counter tops held up? Anything you would change now that its been 2 years ? Thinking of doing this project next week . Kristie, we have moved out of that house. The end result of that kitchen was everything I could have asked for in a DIY farmhouse kitchen remodel. Be ready for the mess. But, the mess is worth the end result. Hi. It looks amazing! How is it holding up? I have a small counter (formica) that I’d like to do, but I fear the concrete chipping off the edges. thank you for your post. I am going to do it! and fill in the cracks of an old print shop wooden slatted table i made to match the countertops. I love your countertops! did you use “white” featherfinish or “grey”? or a mixture? also – do you think it would work over a tile floor?? ?